One of the ideas I'm flushing out in my memoir as I enter the middle stages of drafting is how the Great Plains landscape influences us, and vice versa; how the solitude of prairie produces fear and anxiety, and the outcome is rowcrop monoculture. We feel placeless. Disconnected. We don't know how to honor our families by honoring the land, and vice versa. We don't know our families or land, and we go even more mad. As our grip tightens on nature, in an attempt to assuage our emotions, we dismantle the only thing that could save us emotionally and physically. "There’s an emptiness in the Plains. It’s not a literal emptiness because it is our absence which is most present. And yet our existence has redefined the absence: you can get lost in a corn field, lay down in the wheat and just vanish—no one will ever find you. But stop. A dung beetle is moving from shadow to shadow underneath the sunflowers, pushing its brown marble over pebbles, past cracks, and through thick brush. When I was a kid I’d sit near an ant hill—the inverse funnel pushing out ants like a great heart pumping blood. Each body scatters in every direction, following the marked trails out beyond the center of their lives. Can you imagine being an ant or a dung beetle? Can you imagine? You have never been anything else, following the narrow path laid out for you, but pushing your burdens before you like they were the only treasure you’d ever had. When we enter the earth from another perspective we become our truest selves—we give up the right to take away other lives and enter into an unwritten contract that we signed at our births. We are here, made of the same stuff as everything else. We are here for only a moment, too, already absent in our presence until we go mad with the terror of our short lives and break the contract. The only way to rewrite ourselves is to walk the horizon until the prairie comes back." "First you will catch glimpses of what you take to be gray wisps of haze away off on the horizon; and watching, you will see these vagrant particles deepened gradually, and gather into a definite volume of smoke, black like a raincloud, and bronze about the edge. (A mile in two minutes is not an exceptional rate of speed for a fire once fairly under way.) It halts an instant, you note, over a broad swale where there is standing water; but it is for an instant only. The next moment it reaches the upland again and the dry grass; and directly it grasps a belt of the tall, thick bluestem and the flame leaps suddenly and madly out above the smoke, then subsides again, and the black mass grows blacker than ever, and rolls higher, and you can scent the burning grass, and hear the distant roar of the fire – and awful roar, resembling the sound of artillery in heavy timber. And it is so calm immediately about you that you do not so much as miss the ticking of your watch in your pocket; there is no breath of air stirring, and the sun is shining, and the heavens above you are blue and placid. But the stillness will be broken soon. The oncoming cloud is only a few miles away now, and you easily trace the scarlet and terrific energy at its base; the smoke begins to hurt your eyes, too, and the heat becomes heavily oppressive. And then, all at once, the wind smites and staggers you, that appalling roar deafens you, and the sun is blotted out, and you are in a darkness as of midnight without moon or star. It is an experience of but a dozen seconds or so, this sudden plunge into darkness, though it seems an hour, and when you look out again, you find that the fire has passed you a mile or more to your right, and is still rolling desperately onward; and there in its track are charred and smoldering stacks of hay, and an occasional house aflame and tottering to its fall, and a group of men and boys beating back the outer line of the fire with brush and old clothes, and sending forward little counter fires to met it and if possible keep it at a safe distance. The creek may stop it and smother it when it gets there, though such a hope has mere chance for a warrant: sometimes these mighty conflagrations vault across streams twenty or thirty yards in width, so swift and resistless is their momentum; and as a rule they are effectually stayed only when they reach a wide extent of plowed land, and have to yield, sullenly, for lack of anything more to feed their inexorable fury. In journeying on westward, past the farthest of the homesteaders, and the last of the surveyors, out of sight of the uttermost tokens of civilization, you will see the trampled and dingy places where many of these dismaying fires have their origin – transient camps of hunters or scouting soldiers, or miners going overland to the mountains. You will also find at intervals the ruins of an old fort or stockade to remind you of the Indian days; you will stumble upon numerous towns of the prairie-dogs, and put your vanity as a sportsman to shame with your impotent attempts at shooting the absurd little creatures; you will be kept awake at night, and made afraid in spite of yourself, by the sharp, gaunt cry of the coyote; and then, finally you will come to the cattle-ranches, and the great herds lazily grazing on the level, hushed, and still interminable empire of prairie." "This is an amazing place – a landscape of absence and solitude, filled with subtle fluctuations of life at its most raw and determined. I can only imagine what it looks like in March when the migrations come through, millions of birds in every size and color, pushing their lean bodies north through the desert-less desert of the central Plains. I remember those moments as a child when I was sent out to clean the driveway of snow, and in the falling echo of colliding snowflakes heard nothing else at all, saw nothing else at all – it was like being inside a prayer. There is this same sensation being out in a wheat field as the wind swaddles the heads and only two senses fill the void – a soft underpinning rush of sound that seems to scream go, go, go, and a reassuring and grounding calm of visual monotony that says stay, stay, stay. To be torn in these two directions is the call of the Plains, the tug of being human in a space we can only understand by not moving until the place calls us out (translates us in) to become a part of its rhythms." This is perhaps my favorite angled view of the main garden, capturing most of it in the frame. The paths are hidden by the height of the three main beds. In a few weeks this will all be color, but even now, the texture is appealing. But I'm bored. Is it that I've become accustomed to it? That, like any gardener, I strive for more? Like any artist, the work is never right even when it is? Maybe the paths are too narrow. The plants too thick. Maybe it's the lack of shrubs (not bushes) and sitting areas, or the lack of "rooms" within the space. I'm borrowing my neighbor's invasive red cedars for seclusion, shade, contrast, scale, and a windbreak. The garden feels so small, yet it's 1,500 square feet. I love coneflowers for their variety in appearance from bud to winter seedhead. This year, I'm especially enamored with this phase -- the almost phase. I can hear it grunting, stretching, and relaxing with a long sigh. This phase is almost prettier than any other. Did I just notice it? Have I become bored with the full bloom and now I have moved on to another period in development? What's next, the leaves? I don't know what it is. Well, maybe part of it is the total lack of butterflies and moths this year, and the bumblebees have gone into hiding. Flies and mosquitoes, that's what I have as far as a fourth dimension. 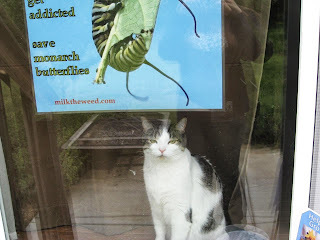 Maybe the purpose of my garden isn't for my pleasure or necessity, but the absent wildlife. Where is the world? Where are you, denizens of bloom, for which I've placed this feast? I miss you and I want to do more. I want a bigger garden. I want more flowering shrubs. More perennials. More fountains. I want to give you my entire lot. I'll tear down the house if you insist. I'll give you the neighborhood, the city, the state. What's wrong with my garden? I'm not sure what part of me feels an unhappiness, but it's there, like a dream that won't let go even in the afternoon. 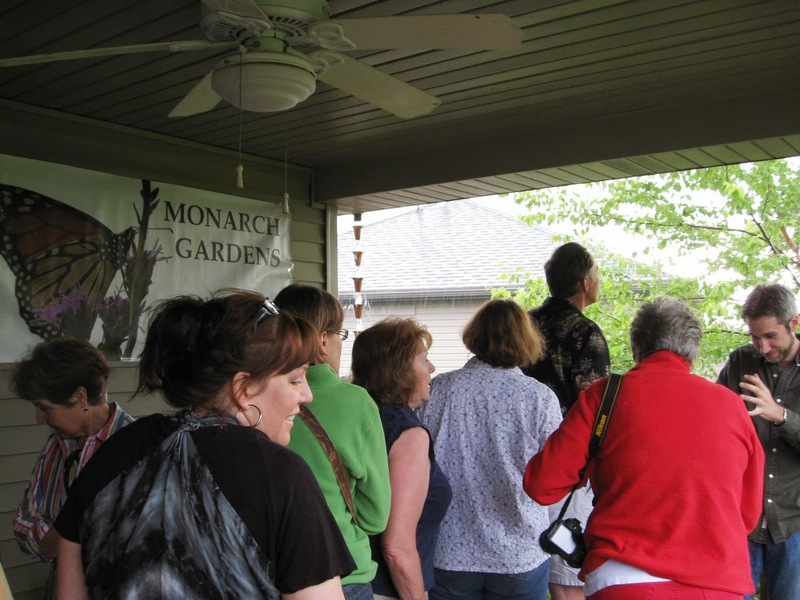 Last weekend my garden was open for the Garden Club of Lincoln Tour. A great time for sure, but practically nothing was blooming -- late July and late September are peak bloom times for me, so I'd like to find a way to establish a fall garden tour here in Lincoln. If anyone has ideas or connections, hit me up, because the blooms and foliage are dazzling in September and October (even November some years). 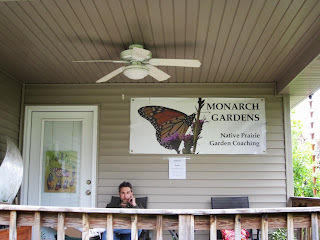 One of the best comments I received / remembered (there were around 200 people who came through, maybe more from 9-1) was that my garden was the only one they actually learned from, instead of just seeing pretty flowers. Yes! Some day I'll have a half to full acre learning garden. Some day. We'll host talks and events and films and parties and workshops. For 10 minutes we had to take cover from the rain, but this gave folks a chance to see the rain chain in action -- so many had never heard of one and loved it, and this helped me explain the dry creek bed that meanders a bit out into the garden. He was not happy about who was on which side of the glass. Before the tour I took a moment to sleep / dream about bigger things. I still have the banner up on the porch -- maybe it's solipsistic, but I love looking up and seeing it as I walk the beds. The garden is the mascot of hope and faith, the echo of passion, the manifestation of purpose. At the end of May my wife and I made another tour of Oklahoma -- the last before I, hopefully, finish a draft of my memoir this summer. I wanted to see more of the natural landscape, because Oklahoma has the most ecoregions of any state (as well as being one of the most biodiverse, thanks to going from high plains in the panhandle to mountains, woods, and steamy marshes in the east). We literally kept hours ahead of the storms as they moved east, missing the El Reno tornado by less than a day: turns out that tornado set the record for the widest one ever recorded at 2.6 miles, missing the 2.5 mile one in Hallam a few years back, which is just south of us here in Lincoln. So, shall we take a tour? First stop were the Salt Flats near Cherokee in north central Oklahoma. Felt like I was standing in a warm Antarctica. Or Utah. I don't know -- decidedly not Oklahoma, which also has a large sand dune formation southwest of the flats. You can dig for crystal formations, and on this day many folks were out there. Above are the Glass Mountains, more butte than mountain. The official written name is Gloss, a misspelling. Supposedly, in the right sunlight the formations sparkle like glass due to a high selenite crystal content. In the Glass Mountains we also discovered the state lizard, the eastern ring collared. Above is the male, and below the female. Northeast of Woodward, in northwest Oklahoma, are the Alabaster Caverns. Bat caves, but without bats on this trip. Except for one outside. Pretty sure he had rabies. ... and says this. Did you see the kid in the fist image riding the dinosaur like a horse? You can agree or not, but I personally find the logic a bit suspect -- of course, the grammatical errors don't help (they should've hired a proofreader). We then headed south to where I spent the first ten years of my life, Weatherford. I used to play on this choochoo. So, that's all you get for Weatherford. Let's visit the 1894 homestead in Corn, 30 minutes southwest. The above is perhaps my favorite picture I've ever taken of the field. The late wheat crop helps. I've visited the place my German-speaking, Russian born, Mennonite great great grandparents settled once each of the last four years. Each year the 2nd barn (1st taken by tornado in the 1940s) looks worse and worse. Here, the south side is about to come down. My great great grandparents actually met in Kansas, where she settled in 1874 and he in 1879. He filed for the first bit of land they could own outright on May 24, 1894 (two years after the Cheyenne reservation was opened), and in August they took the two week trip southwest from central Kansas to western Oklahoma. If you know the cover image on my poetry collection, you know why I had this picture taken. The cover features my grandfather, father, and two uncles in their wheat field about 10 minutes east of this site. We took a day trip down to the Wichita Mountains again, particularly to see the friendliest black-tailed prairie dogs I've ever met. The Wichita Mountains are 80% underground, and the tallest peak is roughly 2,500 feet. If uncovered, they'd be the tallest mountains in the U.S. Mom above would not stop yelping until we walked far enough away, but the prairie dog far above let me get within about 10 feet. A woman flagged us down and told us to take a side road where bison were right at the edge. Sure enough, a male was feeding within about 30 feet! Closest I'd ever been. The Oklahoma state capitol is the only one in the U.S. with a working pumpjack. In fact, the entire city sits atop a major oil field. At the end of our week I was to present at the Association for the Study of Literature and Environment conference in Lawrence, KS, but my panelists all dropped out for various reasons (Linda Hogan was the first, and I was so excited to meet her!). So instead we visited the Tallgrass Prairie National Preserve, where rumor had it bison were being born that minute, but we tuckered out long before we made it to their pasture. I have two months to finish a book I've been researching for almost 4 years, that so far has 60,000 words (two months because that's when the money runs out). I've read about the Mennonite church, the reformation, the inquisition, Mennonite migrations east through Poland and into Ukraine. I've read about Southern Cheyenne culture, the crossroads of Mennonite missions on the reservations in Oklahoma in the 1800s. I've read about Custer, railroads, barbed wire, cattle trails, and treaties. I've read about prairie ecosystems, endangered wildlife, the geologic history of the Plains. I've read every word my grandmother wrote, in diaries from her early 30s to backs of photographs. I've interviewed family, researched in museums and archives and libraries, taken thousands of photos and videos. I've slowly come to hate Oklahoma less, to see something good in myself that's defined by the state, a latent gene, an echo, a memory passed down not just by family but air, grass, and animal -- lives I've never meant but lives I want to save or resurrect. I feel like I'm ready for every contingency, every avenue that may pop up while writing, perhaps too ready, and yet I know the good writing happens with surprise and terror, joy and faith, regret and hope all in the sweaty and exhausting moment of composition. The research will open subconscious ideas I would have never found without having done the hard prep work. I do not know if this book will be any good, I don't know how to write it so it has larger appeal -- but I know I won't let these ideas guide my process, that I'm a writer, an artist, and I will write what I feel I must and that this is better than living my life any other way. The story of Oklahoma is the story of our nation, of our species, of all species put into overdrive and pushed to the moral brink. Oklahoma is a question mark at the end of a sentence we aren't yet willing to answer. Time to explore the old-fashioned meaning of blogging, which way back when certainly meant an online diary. I'm feeling restless and patient at the same time. My wife and I are planning to purchase an acreage in the next few years, perhaps as early as next year. Of course, then we need a place to live, and we are comfortable now, but there's something missing -- an element of fulfillment that is lacking, and perhaps a dash of mid life crisis burning through pants (I should get that looked at....). If we move on to a 50-100 acre spread, where will it be? Will there be opportunities to sell plants, host weddings, have a destination half or full acre garden people will come to and pay for? Will anyone pay for artists residences in small studios we will build on the far edge of the acreage? Can we get CRP money as part income while we start out? Are there other state incentives or tax breaks for restoring prairie? Tax breaks / low interest loans for solar and wind so we can go as much off the grid as possible (and if on grid, maybe we'll make an income)? Where does water come from, and can we treat it on site (I wouldn't trust any well in ag country, but at least there's rain water). We'd likely need some sort of small tractor. And all this equipment would require knowledge on how to maintain it. Sames goes for a greenhouse -- of which I know nothing about. I'm an English PhD. Monetize a neo-settler blog (reverse prairie settler?). Sell native plants on site and at area farmer's markets. A secret mobile project I won't tell you about. Have some sort of event or festival. As soon as I'm done writing the prairie Oklahoma memoir, have it do so well I get paid speaking gigs, workshops, conferences. Have part of acreage in hay or something. There's so much to research, so much risk, so much hard work. And if we fall flat on our faces and go broke, does it matter? Of course it does, but we die and take nothing with us, yet we might be able to give something, create some sort of legacy, something I can't even fathom at this point. Everything tells me to be patient, learn, and plan so that when the opportunity arises we can jump. Everything also tells me I'm nUtZ. What big risk have you taken? Did it pay off? Anything similar to the above? 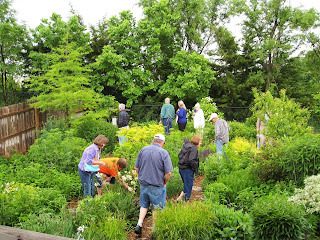 My garden, along with several others, will be on the Garden Club of Lincoln's annual tour. It's free and runs from 9am to 1pm on Saturday, June 8. I'll have prairie seedlings and seed packets for sale, my books, and maybe more goodies. Below is a listing of all the gardens, roughly along A Street all the way across Lincoln. parking lot, 2 blocks north of 45th and A. St., off Mohawk St.
organizations serving the hungry in our community as well as neighbors and church members. Marm Chicken Farm jug band. so you may see a tomato plant in a place where flowers have previously been. vegetation with thrive this year. Taylor Meadows. Take the first right, Rainier Dr., to the first house on the right. followed by bringing over 40 cubic yards of good soil into the yard to create. berms, swales, and a large perennial garden. wall is slowly being developed. appreciate it greatly if you do not park on the grass. Thank you. beds for Carrol’s beautiful flowers. S. 27th and S. 33rd on Sheridan Boulevard. West Plum. The house is at the top of the hill on the left. way station. The garden was named a 2012 best outdoor space by Apartment Therapy. 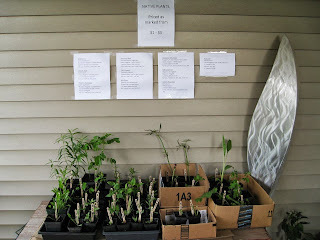 Homegrown plants and seeds will be available for sale. Visit deepmiddle.blogspot.com for photos.